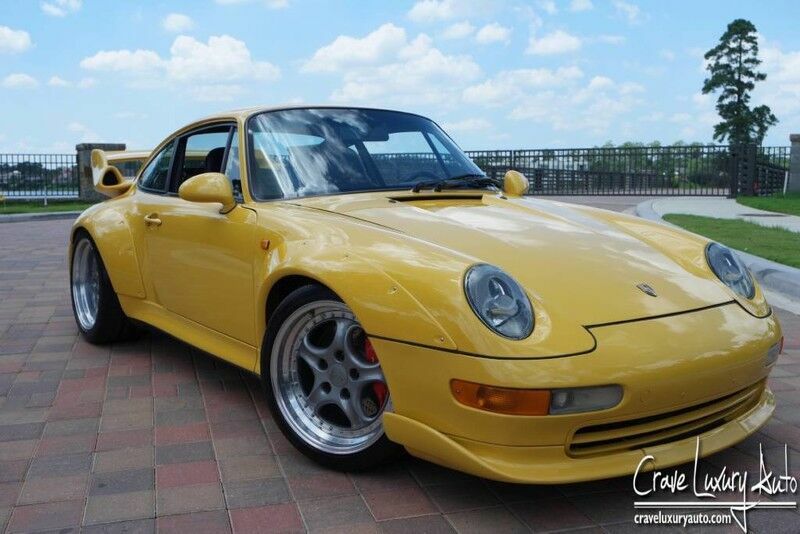 Partner/Operator - EPA and DOT certified Duties have been paid 1 of only 194 Strassenversion (street version) Type 993 GT2s produced in 1996 Very rare Speed Yellow paint, approximately 85% of GT2s were White or Silver Porsche Certificate of Authenticity Twin-turbo 3.6/430 HP engine 6-speed manual transmission Locking differential with automatic limited slip Multi-link rear suspension Upper and lower A-arms with transverse links Power steering 4-wheel disc brakes Finished in Speed Yellow with Black leather interior Sport bucket seats Leather steering wheel Fog lights in White 187 mph top speed from the factory in 1996 Letters regarding emissions modifications and conformity with EPA regulations The all-new 993 introduced for the 1993 model year gave Porsche the opportunity to breath more performance into the road-going Turbo, the first one ever to feature twin turbochargers and all-wheel drive; but the ultimate Porsche of the air-cooled era was the GT2, the stripped-down, lightweight rear-wheel-drive version of the Turbo designed for racing in FIA GT2 competition, in which all-wheel-drive had been banned. Beyond the weight saved by dropping the all-wheel-drive system, the racing-purposed GT2 achieved its official weight of 2,540 pounds through the use of aluminum doors and front decklid, extra-thin glass and a stripped cockpit with a full roll cage that retained only the stock Porsche instrument cluster. Bolt-on plastic fender flares covered extra-wide tires on 18-inch multi-piece wheels, and the ride height was reduced by almost an inch. The GT2 capitalized on the basic 993s all-new light-alloy rear subframe with multi-link coil and wishbone suspension that eliminated the 911s inherent off-throttle oversteer. The GT2 showed the benefits of extensive wind-tunnel development, a new full-width front spoiler with upturned side winglets balanced by a huge two-tiered rear spoiler with integrated air scoops to feed the twin KKK K24 turbochargers. The Turbos 3.6L engine was tuned up to 480 in competition versions, and it was backed by a 6-speed manual transaxle incorporating locking differential with automatic limited slip. While fitted with more comfortable interior appointments, the street versions built to homologate the GT2 were no shrinking violets, delivering 430 HP over a virtually flat torque curve and capable of otherworldly handling and braking. One of 194 Strassenversion (street version) 993 GT2s produced in 1996, this 1996 Porsche 993 GT2 is one of the most highly prized Porsches of the air-cooled era. It presents beautifully in very rare Speed Yellow with a black interior fitted with snug-fitting sport leather bucket seats, yellow seat belts and a leather-wrapped steering wheel. If you have any questions, please call us anytime at 281.651.2101 . Thank You for visiting another Crave Luxury Auto Listing! You can always view our online inventory direct at www.craveluxuryauto.com . If you prefer to communicate via email, one of our representatives is always available at craveluxury@gmail.com .